Could a Game Seven Win for the Penguins Be a Worst-Case Scenario? The fact that the Pittsburgh Penguins are playing a seventh and deciding game against the New York Rangers tonight at Consol Energy Center is, in a word: EMBARRASSING. Even the Pittsburgh Tribune-Review’s Dejan Kovacevic agrees with me. To have a team on the ropes in the multiple ways in which the Pens had the Rangers, and not deliver the knockout blow is inexcusable. The Rangers were a tired, worn out bunch coming into this series, fresh a seven-game slugfest against the Philadelphia Flyers. Any time you go seven rounds with a bitter rival, it takes not only a physical toll, but a mental one as well. The NHL next did the Rangers no favors by forcing them to play seven games in ten days. By the time tomorrow night is finished, New York will have played ten games in 17 days total, going back to game five vs. Philly. This series easily could have, and should have been a sweep for the Penguins. Not because they are that much better than the Rangers, but the Rangers were tired. That much was evident beginning in the second period of game one. A poor start to open the series doomed the Penguins to lose in overtime and fall in to an 0-1 hole. Just imagine what could have been if the Penguins would’ve brought the same intensity and effort that they showed in games two, three, and four. So allow me to pose the question asked as the title here a bit differently: Would winning this seventh and deciding game actually be a bad thing? Lets start with the positive affects of winning this game. First, it means that the Penguins are once again playing in the conference final for the fourth time in seven years. Which would also mean that the Penguins are just four more wins away from appearing in the franchise’s fifth Stanley Cup Final. That’s pretty impressive, no matter how you slice it. It also means that there is more hockey to be seen in the city of Pittsburgh. As a fan, I want more hockey despite how uncomfortable despite how annoying my playoff beard is becoming. Plus the benefits it brings in for the city in terms of money, exposure, etc. Make no mistake though, being one step closer to The Cup is the biggest draw for me, and I would imagine its the same for the vast majority of Penguins’ fans. Unfortunately there is actually a down side to winning this game also. The most glaring is that it hides, for one more round at least, the deeper issues for this team. By masking these deficiencies, it also builds up a false sense of security for almost all in the organization that they are doing the right thing. 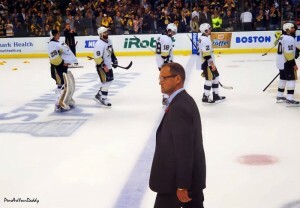 Dan Bylsma needs to go. I’m a big fan of his, but I’m a bigger fan of the logo. While I don’t think Bylsma has lost the room (I think the players by and large enjoy playing for him), I think the team needs to hear a new voice. Bylsma is too easy-going. A team with this much talent needs to have discipline in the form of consequences for not giving their maximum effort in a playoff game. Or for taking undisciplined penalties in a third period where it needs to be all hands on deck. Or for blowing a 3-goal lead and then nearly a 4-goal lead to harken back to the Columbus series. 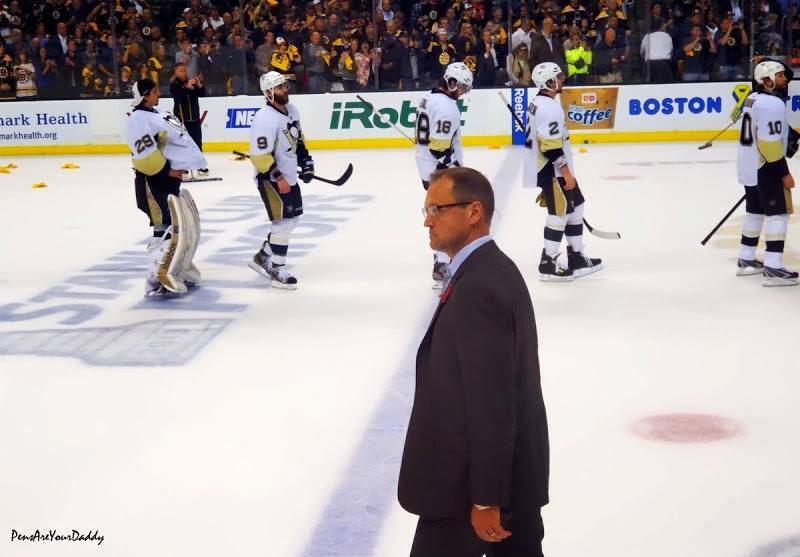 Bylsma has made his living for the past four years off winning the Stanley Cup with another coach’s system with a few of his own tweaks thrown in, and a regular season record that by all accounts is rather impressive, but in the end insignificant. Then there is Ray Shero. The one name that is lost on many in this discussion. This is Shero’s team, and when I say team I’m not only referring to the players. From Shero on down this team is his. Scouts, coaches and players. The players on the ice are not doing their job which reflects negatively on the coach, but when the players on the ice are a collection of scrapheap pick-ups, that reflects negatively on the GM. The draft is another black eye for Shero and management. They’ve drafted and developed rather poorly in the past five seasons, with the one lone bright spot being Olli Maatta. Guys like Simon Despres and Beau Bennett who were lauded last season as being a top-4 defenseman and a top-6 forward respectively have been mired so far this season in obscurity (in Bennett’s minuscule defense, he missed 45 games this season with yet another wrist injury). When you look at some of the offseason moves made by Shero, especially last summer, you have to scratch your head. Rob Scuderi was given a 4-year contract when two would’ve done. Not to mention that Scuderi is not eligible for an amnesty buyout due to signing the contract after the lockout. Starting with Shero, there has been no accountability in this franchise for half a decade. Pretty sad considering the talent on this roster. Thats it! Thats the list. A loss should predicate the beginning of sweeping changes within the organization. It needs to begin with the head coach, and must permeate throughout the locker room. Cut the dead weight as it were. Shero needs to rethink his draft and team-building strategies. There is a lot that he has done that I’ve really liked. His ability to swing a trade at the deadline is second to none in terms of returning value. You needn’t look any further than the Jordan Staal trade at the 2012 draft. Brandon Sutter (who may finally be coming into his own in these playoffs), a draft pick which was used on highly-touted prospect Derrick Pouliot, and defenseman Brian Dumoulin whom I’ve been high on since he arrived here. Instead of drafting puck-moving defensemen who will be used as nothing more than trade bait at the deadline for a player of perceived need, why not draft that needed player and develop him? If he plays poorly upon entering the NHL, let him try to play his way out of it instead of healthy-scratching for two weeks before shipping him back to Wilkes-Barre/Scranton (Despres). Or, if he’s playing well enough to stick with the big club but not producing at the rate of team expectation, try moving him up to play with a better player like Crosby or Malkin (Bennett). A loss tomorrow night, while excruciating because of the finality it will bring to this season, will come with a glimmer of hope for the future. At least to me. Thats considering that there would actually be some accountability had within the Pittsburgh Penguins organization.